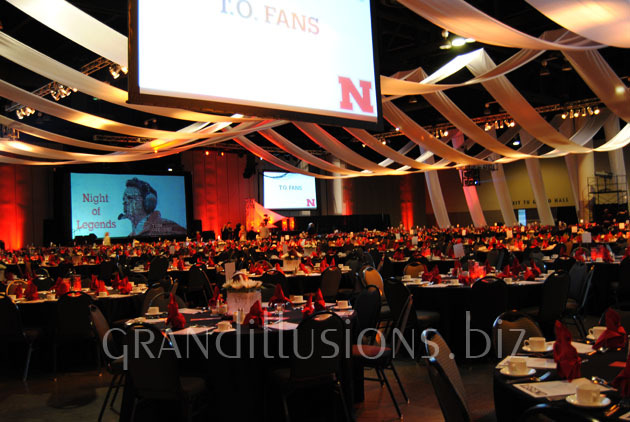 For over 29 years Grand Illusions has been decorating corporate events large and small; from the Tom Osborne “Night of Champions” at the Century Link Center in Omaha to training/motivational meetings. We have set the mood for Mardi Gras, patriotic themes, glamorous Hollywood “Oscars” night, tropical nights and more. At Grand Illusions we can help you generate a theme or work with the one you have. Either way we will develop the decor needed to create an authentic atmosphere to make your event a much talked about, successful event. Anything is possible. For your next product introduction, convention, training event, party or picnic, give us a call. Check out our Corporate Gallery for a peek at what we can do. *Click here to see those fire performers in action!